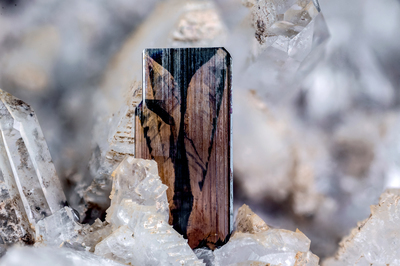 Brown brookite crystal, with the typical black color similar to an hourglass in the middle. It has grown on adularia crystals and associated with quartz crystals. Collection and photo of Gianfranco Ciccolini. Nikon D750, bellows, Scheider Kreuznach Componon 80 mm; f: 5.6. Focal using 7.